Getting more and more new members here, so I think we need a forum for them to introduce themselves. You old timers can do the same, if you would like. General stuff about keeping and maintaining cornsnakes in captivity. Use this forum to post threads related to home made projects for your corns... Vivariums, hides, decorations, accessories, you name it. Anything to save some bucks or give your personalized touch. Anything related to general or specific health problems. Issues having to do with feeding problems or tips. 2 year old corn fasting? 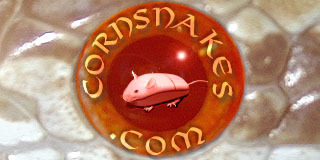 Any and all issues about raising rats, mice, or anything else that you feed your cornsnakes. Where do you buy mice? General topics or questions concerning the way your cornsnake may be acting. Any topics concerning breeding of the cornsnake, brumation, egg laying, or issues concerning problems in any step along the way. Field observations of corn snakes, field collecting, or just general topics about the natural environment they are found in. Discussions about genetics issues and/or the various cultivars for cornsnakes commercially available. A collective field guide to the cultivars and cultigens (morphs) of corn snakes. Show them off! Post photos of your prizes and your favorities for everyone else to see and comment on. This forum is for the discussion of technical details of how to take good pictures as well as discuss the equipment used in that pursuit. This is a "none of the above" forum. All posts should still be related to cornsnakes in one form or another, but some slight off topic posting is fine. Discussion about general topics that are really off topic concerning corn snakes, or just about any old chit at all.